After reading this review, I had my doubts about going. If anyone has seen it, let me know what you think. Should we go or not? Anyway, let me know what you thought about the movie. 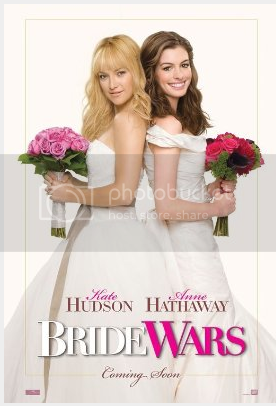 We will go dress shopping with my cousin so I thought it would be fun to go see Bride Wars afterward. Someone please chime in with your thoughts! Should we go see it? Yay or nay? Before going to watch it, i read a couple of BAD reviews too. BUT, Deep down, I knew I was going to go watch it Bad reviews or not. I really enjoyed it =) Shhh.. even Fi;) I say, Go have a great time dress shopping & Movie time after. I saw it yesterday, and I really enjoyed it! It was funny and at the same time pulled at my heartsrings a little :) I definitely think you should see it. I was going to see it with my girls then read the reviews and I decided they didn't need to see it. Although I might still see it with a girl friend... you know, to screen it for my girls. lol. this movie was go good. i really laughed and kinda brought me to tears. i saw it with my sister, she is getting married in sept. Went to see it with my GF's and we all loved it. Definitely go watch it.